You're looking at a once-in-a-lifetime scientific discovery. 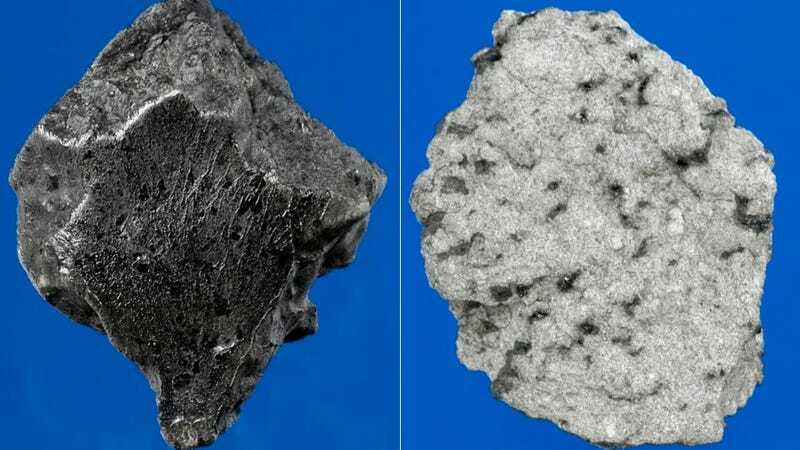 A team of experts announced today that these fragments of space rock, discovered last month near Foumzgit, Morocco, are in fact meteorites from Mars. Martian meteorites are incredibly rare; taken together, all the Mars rocks on Earth add up to less than 240 pounds. But rarer still are meteorites recovered soon after they arrived on Earth. And that's what makes this find even more exciting — these specimens are fresh. The hunks of Martian rock that you see here are just two pieces [hi-res images of each available here and here] from some 15 pounds of rock that a committee of experts — headed up by University of Alberta meteorite expert Chris Herd — believe fell to Earth during a meteorite shower last July. The last time scientists chemically confirmed the arrival of fresh Martian rocks on Earth was in 1962. Before that? 1911, 1865, and 1815. In other words, this type of discovery is exceedingly rare. Fresh Martian samples are considered especially valuable because they've experienced less exposure to Earthly contamination. Recently arrived meteors are easier to rid of this contamination, and are therefore considered more precious from a scientific standpoint. Remember in 1996, when scientists thought they'd found traces of life in a Martian meteorite that was found buried in Antarctica in 1984? Later investigations concluded there was not enough evidence to support the claim. If similar evidence is found in the 15 pounds of meteorite discovered last month, we could be looking at a completely different story. "It's scientifically invaluable," Herd told the Associated Press. "These are really beautiful specimens. It's a rare type, so fresh and aesthetically pleasing." Carl Agee, director of the Institute of Meteoritics and curator at the University of New Mexico, echoed Herd's sentiments. "It's incredibly fresh. It's highly valuable for that reason... For someone who knows their Martian, this is a beauty. It's gorgeous."